The Cordillera Blanca Mountains are what trekking is all about. Beautiful views, friendly natives, and the optional comforts of guides, porters, and cooks make trekking these mountains a delight all around. The trail takes you to altitudes ranging from 3,000 meters to 4,800 meters, which provide gorgeous views of snow-capped peaks, emerald lakes, and flower-filled meadows. Because of its popularity, the Santa Cruz trek is a well-maintained route that has clearly marked trails and organized campsites. It’s a good choice for an introductory expedition of the region, because it is easy to moderate in level. You can begin the journey by walking across traditional Andean villages on your way to Yungay. This begins the trek through the Llanganuco Valley, which opens up to the glacier-fed Llanganuco Lakes. There is a campsite at the top of the second lake, where you’ll wake up to a sky filled with snow-capped peaks and lakes reflecting the natural splendor of the region. You’ll find the second day to be the most challenging, with seven hours of hiking through the narrow valley. 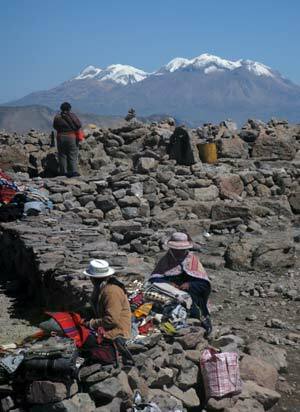 But it’s well worth it, with awe-inspiring views of the massive Chacraraju (6096m) and Piramide (5800m). As you break camp for the night in the pink and silver glow of an Andean sunset, the serenity of the striking natural landscape makes this a journey of a lifetime. Continue over Punta Union, the highest point at 4750m. From here you can start to see the magnitude of the Cordillera Blanca. In the distance, you can see the first glimpse of the peak of Taulliraju (5791m) and emerald green lakes. Quickly, the trail descends to the lovely village of Cashapampa (2950m), where trekkers can run through expansive fields filled with grazing llamas and goats, pick wild flowers, and enjoy the bubbling waters of a nearby wooded stream. There are many tour companies that take groups on expeditions — and take the worry out of planning — by providing all necessary camping equipment, food, and supplies. Many of these agencies can be found in Huarez. Depending on the length of the trek and number of people, prices generally range from 50 to 100 USD per day. The Cordillera Blanca are one of the last frontiers, one of the few places on earth with such natural, unspoiled landscape. International trekkers flock to this region every year to experience the awe-inspiring serenity and unsurpassed natural beauty. Many hikers even claim they get their strength and stamina from the power of the mountains that stand majestically in the horizon. Michael Zurakhinsky has traveled through South America for the last seven years. He is an editor and consultant of http://www.allaboutperutravel.com. The website offers detailed information on traveling in Peru. To use this article in your publication, click here.